This little French restaurant is a hidden gem, tucked away in the midst of the luxury shoe department in Selfridges on Oxford Street. With Spring still in hiding in England, Aubaine is a great alternative to al-fresco dining, with bright natural light and Spring blooms, all in the comfort and convenience of a department store. 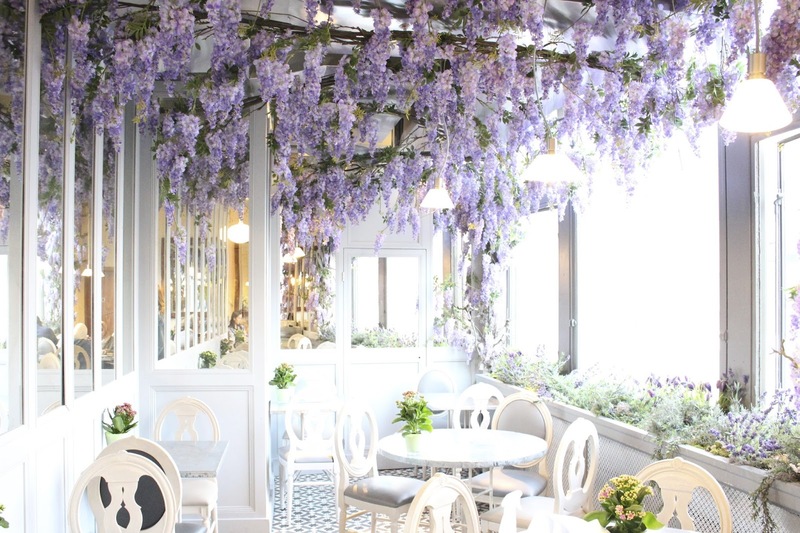 The beautiful wisteria laden ceiling creates a picturesque (and instagrammable!) setting to enjoy a long, lazy lunch. Or make as we did, and treat yourself to a glass of wine and one of the pâtisserie-inspired desserts displayed temptingly on the counter as you walk in. A tranquil retreat, which offers the perfect respite from a hard day of shopping !